I love latkes. Andrew makes the best ever. Wish they were low-cal. At least I put apple sauce on mine instead of sour cream. We’re really low key this year. Game nights and just spending time together is key. I heard a radio spot talking about the meaning of Chanukah. I wish I could remember the organization. It talked about religious freedom and how that is the core of this holiday. How we should work diligently to protect our freedom and to help others who don’t have the same advantages. If you know who placed this, tell me, okay? It’s driving me crazy. My huge project that made my head hurt is coming to a close. The client does, in fact, like my work. Phew. Wish I’d been more confident earlier in the process. Would have saved some real stress. Okay, this is only about Chanukah because it happened this week. So shoot me. Adam Sandler’s Chanukah song cracks me up. I heard it on the radio yesterday. Funny guy. Someone asked me at the bus stop this morning if I was sad that Chanukah was so early this year. Chanukah is not the Jewish Christmas. Why would I be sad? Our great friends with whom we spend Christmas every year are joining us for Chanukah this weekend. Should be fun! MORE LATKES! Did you see the Chinese Restaurant video? It’s about Jews at Christmas. Aside from the blatant stereotyping, I thought it was entertaining. One of my colleagues asked me what she could take to a friend’s house for a Chanukah dinner. I suggested jelly donuts – it is traditional in Israel. Her friends had never heard of it and told her I was pulling her leg! Funny. We’ll see a huge extended family this weekend to celebrate. here are 6 in my parent’s generation, 17 in my generation, and 20 in my kids’ generation (and counting)… As we’ve done in the past, there will be no gifts. We’ll all contribute to a charity together. Our kids have enough. I love that we do this. The boys bought me beautiful jewelry for the holiday. Of course, they gave it to me last month. Who can wait? Tomorrow night is a special dinner and service at our congregation. We’re going with great friends – I am grateful for E’s nudge. We always enjoy these events. Tonight we won’t have a festive meal because Andrew left me in charge. So soup it is. But I predict a fun night together. < Power to the people. Wendy, this was a lovely and funny post. Yes, that video was a little stereotypical, and it bothered me. Rich and I have been lighting our menorah in honor of Kristin’s conversion, Jeff (or course) and to honor our grandchildren. It is next to a small Christmas tree in our dining area. People look totally confused when they see them together. When I tell them that we actually celebrate Solstice, they don’t know what to think! Last night when Rich lit the menorah candle, he didn’t know what to do, so he sang the Dreidle song. It was sweet. 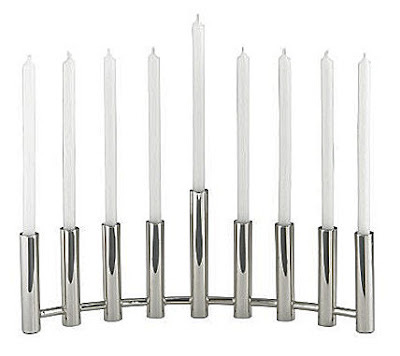 Happy Hanukkah to your beautiful family. wouldn’t be services without you guys! !